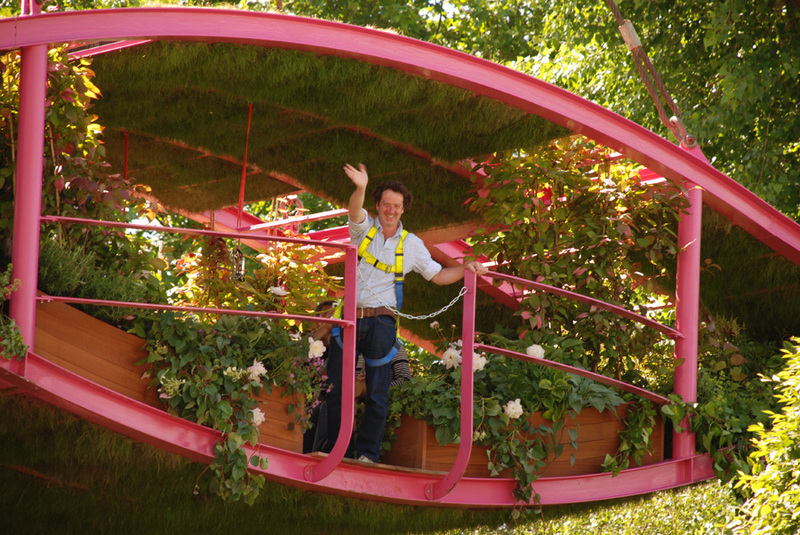 I promised you some more highlights of the Chelsea Flower Show and I suspect that by now you have heard much talk about Diarmuid Gavin’s Garden which was certainly attracting lots of attention on Wednesday. 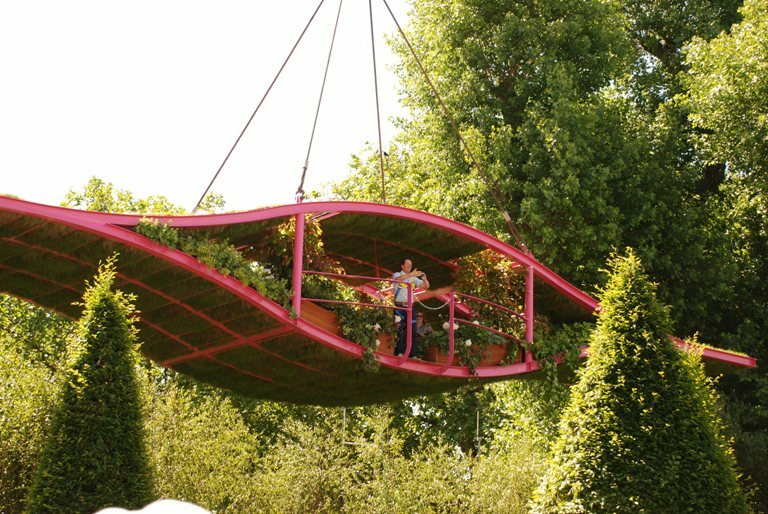 He designed the Irish Sky Garden for sponsors, Cork City Council and he earned himself a well deserved Gold medal. As you’d expect, his garden was full of drama and he was very much a part of it, putting on a performance for the visitors. Here he is in the planted pod, the “wonkavator” which was raised up above the garden at various points throughout the day. If any of you have saw the BBC coverage of the garden earlier on in the week you’ll know that the garden was inspired by the visual effects used in the film Avatar. The rest of the garden was brilliantly put together and the structure of the garden was perfect. 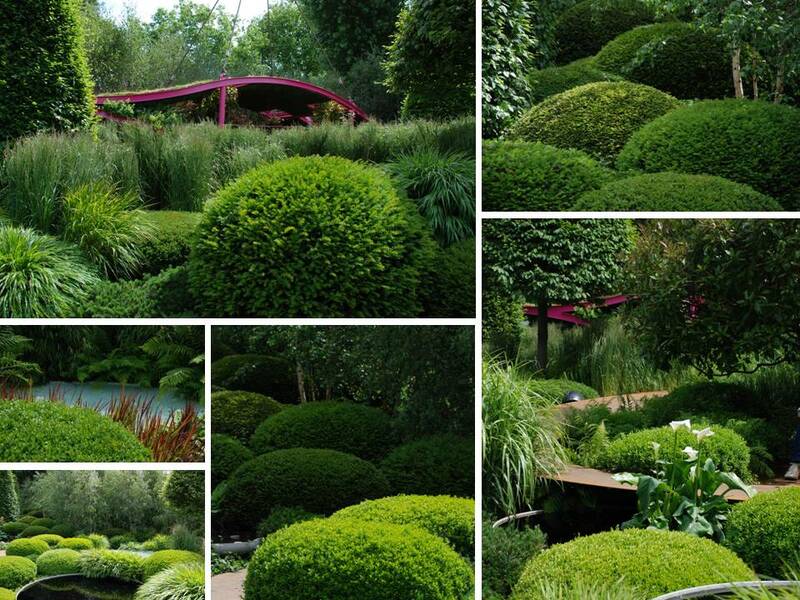 Topiary yew spheres tumbling down the hill in cloud formations and clipped cone-shaped Carpinus betulus (Hornbeam) give real 3 dimension to the space and lead the eye through the garden on the floating pathway towards the pod. I loved the look of the yew which had not been clipped yet so created a sort of fuzzy edge to the formality of the round shapes. I think this garden really demonstrated the power of foliage and using green in the garden. The grasses and bamboo gave softness to the structure of the yew and hornbeam and it felt calm and completely connected to the main feature of the garden, the flying machine, I loved it!